Bisphenol A, also known as BPA is a synthetic chemical that has been used for many industrial purposes. Ever since its discovery by a Russian chemist in 1891, BPA began to gain some popularity due to its ability to serve as a vital compound for most materials that are still widely used up to this day. Some notable examples include plastic bottles, sports equipment, water pipe linings, beverage cans, and of course, thermal papers that are usually used for sales receipts. However, the application of BPA on various products started to raise some concerns regarding the chemical’s health risk issues over the past decades. Recent studies showed that traces of BPA could permeate through almost anything that it could come in contact with. Too much exposure to BPA can bring adverse effects to the body specifically the brain and hormone production. Luckily enough, some companies that manufacture products with BPA have found some ways as to how they can limit or even eliminate the use of such potentially harmful chemical. For instance, thermal paper rolls started to undergo some modifications so that it won’t be needing any BPA to serve its purpose. These developments eventually bore positive results with the emergence of BPA-free thermal paper rolls. This article will discuss all about the significant benefits and possible disadvantages of using BPA-free thermal papers on different business applications. It limits all the possible health risks – In a study published by Springer-Verlag, anyone who constantly handles BPA receipt paper is prone to be exposed to an estimated 71 micrograms of BPA which is 42 times less than the tolerable daily intake. These findings can be quite reassuring indeed, but most people still tend to be more vigilant when they hear something about a certain chemical. So, using a BPA-free thermal paper can lessen all the worries you can have not only to your employees but also to your loyal customers. Letting them know that you care for their safety is a true mark of a successful businessman. It’s environment-friendly – Once put into waste, BPA products will start to bring some negative tolls to everyone within the area especially if that area is close to the vicinity of wildlife. Animals can suffer the same effects of BPA as well, altering their ability to reproduce. It provides the same image quality – Many people wonder whether the absence of BPA affects the quality of prints that the thermal paper produce. While it is true that BPA is excellent for making stable and clear thermal prints, BPA-free thermal papers are still very competitive in terms of overall print quality. The alternatives for BPA – Several alternative materials can be used for manufacturing thermal papers other than BPA: BPS and urea. BPS is the most common substitute for BPA because the latter has similar characteristics and properties to the former. BPA is still more harmful compared to BPS. But even BPS can trigger the effects identical to BPA if used prematurely. It cost you a bit more – Another BPA alternative for thermal papers is urea. 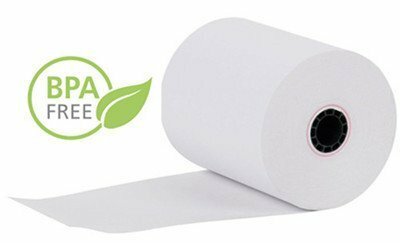 This paper roll works the best if you want something that is both BPA and BPS free. It’s an entirely different compound that doesn’t bring the negative effects of the said chemicals but expects that this type of thermal paper is a bit more expensive nowadays. BPA-free thermal papers can save everyone from health issues associated with BPA. If you’re a business owner looking for paper rolls that are high in quality and safe to use, it might be the best option for you.